landscape, and hazards in the subtle variations of the snow and ice, and the rhythm of traditional Inuit life is tuned and adapted to the cryosphere's mood. Explicit in the Inuktitut lexicon are descriptors for the density, viscosity, age, hardness, and water content of snow and the spatial variability of snow on the ground: uniform, hummocky, drifted, crusted. These features also shape the interactions of snow within the climate system. The density and depth of fresh snow determine its thermal (insulating) properties, which are important to growth of sea ice, freshwater ice, and permafrost. Snow water content is the essential parameter of interest for glacier mass balance and water resources applications (snow hydrology). The seasonality of snowfall and the locations where snow preferentially accumulates on the landscape influence all of these systems. These also impact society through avalanche hazards, transportation disruptions, and recreational opportunities (i.e., ski areas). As discussed in chapter 2, initial snow density is variable and is a function of the moisture content, temperature, and wind conditions during snowfall; 100 kg m-3 is typical. 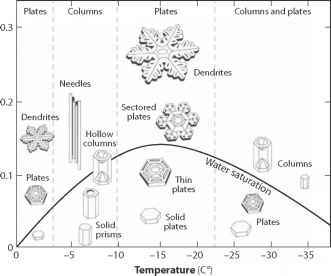 Once snow is on the ground, these same meteorological variables play a strong role in grain-scale snow metamorphism and densification of the snowpack. In cold, dry conditions, sustained winds of several meters per second will harden or stiffen fresh snow into something colloquially called "wind slab," which reaches densities of 400 kg m-3. Wind slab has rounded, well-packed snow grains, with uniform and "fine" grain sizes of less than 0.5 mm. This snow can generally support a person or sled. In extreme cases, strong winds and a dearth of fresh snow can lead to continued evolution of surface snow into a sculpted, extremely hard version of wind slab known as sastrugi. In the absence of strong winds, cold snowpacks can remain relatively light for months. With time and with buildup of the snowpack, grain sintering in buried snow brings about gradual densification. This is the slow rounding of crystals and development of intergranular bonds through systematic vapor transport from angular to rounded crystals. These processes are accelerated at warm temperatures. Weakly bonded stellar and angular crystals can persist throughout the winter, until thawing of the snowpack introduces meltwater and rapid grain metamorphism. Vapor diffusion and deposition within a snowpack also leads to postdepositional modification of the snow stratigraphy. Moisture from the atmosphere, the underlying ground, or from sublimation or evaporation within the snowpack itself moves upward or downward along pressure gradients, from warm to cold regions of the snowpack. This vapor can be deposited on contact with the colder snow grains. In most seasonal snowpacks, this is an upward movement from geothermally warmed lower layers in the snowpack to the atmospherically cooled layers above. Because of snow's low thermal conductivity, it can support strong temperature gradients (e.g., >10°C m1), which are conducive to strong vapor pressure gradients and vapor transport. This produces depth hoar in a snowpack: the growth of large, faceted, and poorly bonded snow grains. Depth hoar that forms in Arctic snowpacks in the fall and early winter is often a few decimeters deep, and the grains can remain faceted, with sizes of a few millimeters, until the following summer, giving a "hollow" layer beneath the overlying winter wind slab. In lower-latitude mountain snowpacks, depth hoar creates weak layers that can also persist for several months and are implicated in deep slab avalanches. As well as acting as an agent of densification, wind mobilizes and transports snow. Emerson's The Snowstorm beautifully captures the "frolic architecture" of snow that is shaped by winds. Blowing snow gives blizzards their distinct, disruptive character, with horizontal advection of snow particles obscuring visibility and leading to what can seem like several hours of snowfall with negligible snow accumulation on the ground. The stronger the wind, the more loose snow that can be mobilized. Deposition is a similar process to saltation of dust particles or other aerosols transported in the atmosphere. Blowing snow creates snowdrifts in places where wind flux is convergent or where turbulent eddies result in downward ad-vection and snow deposition. The classical example is snow fences, which create eddies that induce snow accumulation downstream of the obstruction. Natural topographic variability produces the same effect; snow is scoured from the upwind side of obstacles and deposited in the lee side or in hollows and cavities. This has the effect of smoothing out the topography. In mountainous terrain, snow is similarly scoured from the upstream side of ridge tops and deposited in treacherous cornices (overhanging snowdrifts on the ridge top) and on the lee slopes that lie below. Wind-blown snow is mainly redistribution over an area for a given snowfall event. over a large enough area, the depth and water-equivalence of snow on the ground averages out and is representative of the amount of precipitation that fell from the atmosphere. This can be important to glacier mass balance or water resources studies, which are based on the total snow on the ground within a given catchment; redistribution affects local snow depth and the timing of melt, but may not have a strong effect on the total annual mass/water budget. However, some blowing snow may be carried large distances by the wind and redeposited off-glacier or in a different hydrological catchment, removing it from the system. Similarly, some wind-blown snow is subject to blowing-snow sublimation, a process that can remove mass from the system. Snow on the ground is also lost to direct sublimation into the atmosphere. This is a function of wind speed, humidity, and boundary-l ayer turbulence, which promotes exchanges of momentum, mass, and energy between the surface and the atmosphere. As introduced in chapter 3, the surface (skin) layer over snow and ice is typically assumed to be saturated, with the saturation vapor pressure determined by the snow/ice surface temperature. If vapor pressure in the overlying air is less than this, the vapor pressure gradient supports sublimation (or evaporation, if liquid water is present). Condensation or deposition from the atmosphere occurs in the opposite situation, and when it is cold and calm this leads to the formation of elegant hoar frost crystals in the surface snow, as described earlier. Detailed information about snowfall is available from direct measurements in populated regions of Europe, Russia, and North America over the past century. Much of this information is archived as snow depth or fresh snowfall totals, with snow-water equivalence (SWE) estimated based on the assumption that fresh snow has a density of 100 kg m-3. The most reliable methods of measuring SWE are to melt the collected snowfall and measure it as if it were liquid precipitation or to sample it directly for snow density (i.e. through weighing of snow samples of known volume). Such methods became routine in the middle of the 20th century, along with the introduction of regular snow surveys in many of the world's mountain regions. Beginning in the 1960s, visible-wavelength satellite imagery has provided exceptional mapping of snow-covered area in the Northern Hemisphere. Available station data allow Northern Hemisphere snowpack trends to be extended back to 1922, though with less confidence. For the period 1967-2010, the satellite era, the mean Northern Hemisphere snow-covered area was 24.9 X 106 km2, peaking in January (46.7 X 106 km2) and reaching an annual minimum in August (3.1 X 106 km2). Most of the residual summer snow in the Northern Hemisphere is on the Greenland ice sheet. Additional snow falls on the oceans at high latitudes but is quickly melted, excepting that which accumulates on sea ice. Snow on sea ice is not accounted for in the snow cover data. Figure 1.3 plots the average winter snow cover in each hemisphere. This geography closely follows the 0°c isotherm on the landscape. Given cold enough temperatures for snow, the thickness and SWE of seasonal snowpacks are generally proportional to the available moisture in a region. This is a function of the temperature of the air, continentality (distance from the ocean or other major water bodies), and the prevailing winds. Maritime environments at midlatitudes see large accumulations of snow, as these settings offer the ideal combination of cool winter weather, ample moisture supply, and baroclinic eddies that advect this moisture inland. Precipitation rains out as air masses cool over the continents. Latitudes of the polar front (the polar jet stream) are optimal for this, as meridional meandering of the jet stream generates repeated cyclonic disturbances along winter storm tracks. As discussed earlier, this produces heavy snowpacks where these weather systems intersect elevated topography (e.g. the coastal mountains of North America, Norway, Iceland, and the Southern Alps of New Zealand). Annual snow accumulations in excess of 2000 mm w.e. are common here. comparable snow accumulation totals are possible on the windward side of other major orographic features like the southeast margin of the Greenland ice sheet and the southern slopes of the Himalayas. where Ta is in degrees celsius, and the vapor pressures have the unit millibar. The derivation of these expressions can be found in most texts on atmospheric thermodynamics. More elaborate parameterizations are available, but Eqs. (4.2) and (4.3) are accurate to within 1% for most Earth-surface temperatures. Higher-order approximations are recommended at very cold temperatures (e.g., below -40°C). The strong sensitivity of saturation vapor pressure to temperature provides a hard limit on precipitation in polar regions. cold air is simply too dry to provide large amounts of snowfall. The interior regions of the Antarctic and Greenland ice sheets are polar deserts, with annual precipitation totals of less than 250 mm w.e. Continental polar tundra environments in Canada and Russia are similar; for instance, Eureka Nunavut (79°59' N, 85°56' W) had an average annual precipitation of 70 mm w.e. from 1950 to 2009, with 52 mm w.e. falling as snow. Similar aridification is found in the lee of mountain regions at lower latitudes. For example, annual snow accumulation in the Chilean Andes, on the eastern side of the Rocky Mountains, or on the northern slopes of the Himalayas is about an order of magnitude less than that on the windward side. Hydrometeors advect and drift with the wind, with downstream advection of tens of kilometers. This augments the snowpack in the vicinity of continental divides and in the upper regions of lee slopes. Aridity sets in downstream of this. This depends on the moisture content and temperature of an air mass; large quantities of moisture may survive the passage across low orographic obstacles or the initial ranges of mountain chains. For orographic barriers that are not too large, snow accumulation usually increases with elevation on windward slopes, with steep annual snow accumulation gradients: 1000 mm w.e. km-1 is typical, though this is highly variable and is ultimately limited by the available moisture. For especially high mountain barriers, such as the Andes, the Himalayas, or the Saint Elias Mountains, drying of the air mass occurs at high elevations on the windward side. In this case, precipitation and snow accumulation usually increase with elevation to a point (e.g., 3000 to 4000 m), then decline above this altitude. These precipitation processes and snow-pack gradients are a steep challenge for climate models, which are unable to resolve mountain topography in sufficient detail. Snow on the ground in mountain environments is also subject to avalanching and a strong degree of wind redistribution. This tends to limit snow accumulation on steep slopes and ridge tops while promoting snow deposition on the gentler slopes of alpine valleys, meadows, and forests. These environments naturally give rise to mountain glaciers. Because snow extends to elevations and latitudes where it is near the threshold for viability—temperatures close to 0°C—snow cover is very sensitive to warming or cooling. The record of recent changes in snow-covered area is discussed in chapter 9. There is scattered observational data on snowpack variations prior to the 20th century— anecdotal or through direct observations at select sites (typically measurements of snow depth). There is no direct geological proxy for past snow cover, although lichen-free zones in tundra environments provide indications of areas that were covered by snow or ice for extended periods prior to the 20th century. The timing and extent of spring runoff in seasonally snow-covered catchments can also leave distinctive traces in lacustrine sediments. certain tree species are sensitive to spring snowpack through its influence on soil moisture and the onset of the growing season; hence, some tree-ring records offer indirect reconstructions of past snowpack variability. hence, a combination of precipitation and temperature influences. Where it is possible to isolate a precipitation signal, it can be difficult to interpret this on a regional scale. For most of the Earth's surface, precipitation is a mixture of snowfall and rainfall. Warmer and wetter conditions in a region may register as an increase in snow accumulation at high altitudes but a loss of snow at low altitudes, as rainfall increases and snowfall declines. At the highest elevations and latitudes, precipitation roughly equates to snow accumulation, and ice cores acquired from these latitudes may offer regional- or even synoptic-scale insights into precipitation variability. For instance, snow accumulation records from ice cores in the Saint Elias Mountains in Yukon and Alaska are heavily influenced by low-frequency variability in meridional circulation in the north Pacific, which is affected by El Niño-Southern Oscillation (ENSO) and decadal- to century-scale variability in Pacific sea surface temperatures. Snow accumulation records from these sites therefore include the influences of climate variability on a spectrum of timescales, which needs to be decoded.